Christie Baumgartner Yoga offers a number of corporate yoga services and can teach yoga at your office, yoga at a team offsite or development day, or instruct yoga for your sports team. Clients have included Lululemon Athletica, the University of British Columbia Thunderbirds, Equinox Gyms, John Fluevog Shoes, and more. I teach all kinds of groups and help show them how to get the most out of their time on the mat, fostering connections with self and those around them. Whether it's yoga at the office, as recovery for your sports team, to bring your community together, or something else, I would love the opportunity to facilitate a yoga practice that is right for you. If there is a specific focus or intention (for example: meditation, partner work) I'm happy to create a class specific to your group. When Equinox launched their much anticipated location in Vancouver's Coal Harbour neighbourhood, they brought together a community of local influencers and flew them by helicopter to a special yoga class led by yours truly at the top of the Sea to Sky Gondola in Squamish. I continue to be a regular on the schedule at Equinox. I work with Lululemon in a number of ways, including teaching yoga at their global head office in Kitsilano, and at their annual Vendor Summit offsite; modelling in various marketing campaigns; and serving as a subject matter expert directing product photoshoots. I've also taught yoga at some of their special events including the SeaWheeze Half-Marathon and summer Nooner Yoga series at Jack Poole Plaza. I lead weekly yoga classes at the University of British Columbia, helping several varsity sports teams (including hockey, football, volleyball, soccer, basketball, baseball, track & field, rugby, and swimming) with the recovery component of their training programs. Our work focuses on stretching, mobility, and connecting with the breath, cultivating enhanced body awareness that contributes to greater athletic performance. Yoga with puppies! I love my weekly visit to the John Fluevog store in Gastown where I teach employees and their four-legged friends how to connect with themselves and each other on the mat. 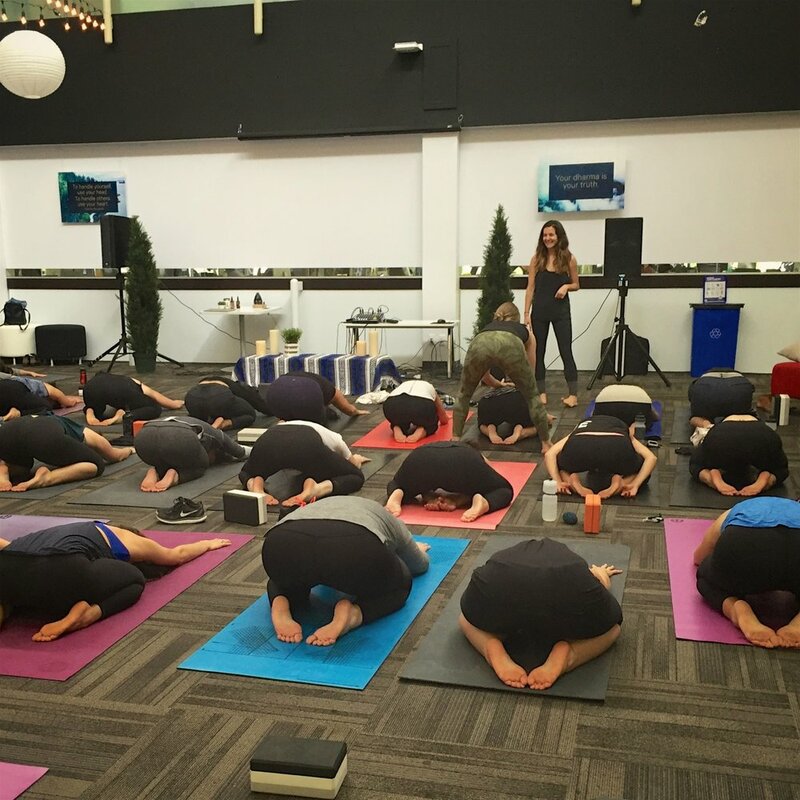 Curious about how yoga could benefit your team or office? Need a yoga instructor for a special event or offsite? I am based in Vancouver and am also open to travel. Use the form below to send me a message and we can discuss your needs. Thanks for your message – I'm excited to connect with you! I'll get back to you as soon as I can.